Good Bite added another segment to their Real Fast Food series, and this time it’s my Spicy Shrimp Salad, one of my favorite super fast meals. 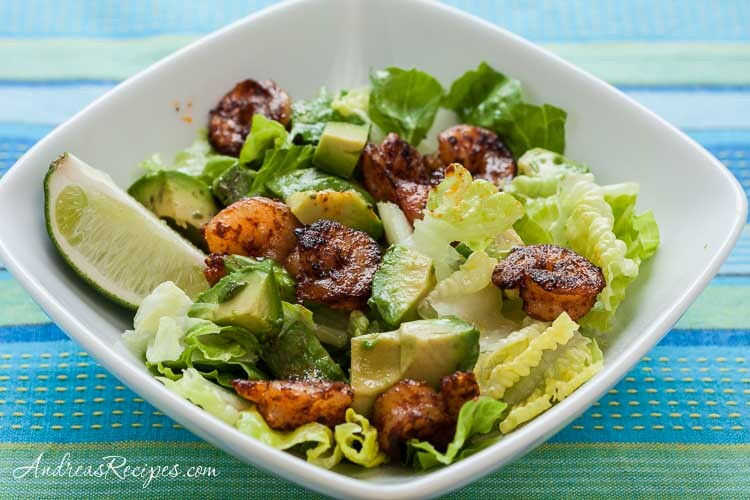 We just toss the shrimp in chili powder and sauté it, put it in a bowl with lettuce and avocado, drizzle a little of the chili oil from the pan over it all and give it a squeeze of lime. A good fast meal in nothing flat. If you can’t do shellfish, you can substitute a firm white fish that has been cut into bite size chunks. 1. Season the shrimp with the chili powder. 2. Heat the oil in a large skillet over medium-high heat. Add the shrimp and cook, stirring, until pink, about 4 minutes. Add the sea salt and cook, stirring, for 1 to 2 more minutes. Remove from heat. cooked shrimp to each bowl, then top each with 1 tablespoon of the chili oil from the skilletand squeeze a couple of the lime wedges over each salad. Serve immediately. Wow! Love all the multimedia elements on your site and the shrimp salad looks FABULOUS. Great video, short, easy to follow, and inviting. That’s great! Even faster than driving to a restaurant or fast food joint. Can’t wait to give it a try. I love making spicy shrimp or chicken for a lunch salad. Love the idea of adding chili oil. I love quick and simple recipes like these with just a few everyday ingredients. Looks healthy and delicious. I’m not sure the chili powder alone would provide enough kick for me, though. Any thoughts on what other flavors might complement the shrimp? Hi Jeannie. You can always add a pinch of cayenne or chipotle pepper to make it a little more spicy.